A protocol is a specific process recommended by the SCA Standards Committee and Professional Development Department. An SCA protocol is a qualifiable recommended process that the standards committee has agreed upon and may include individual standards. The Grading Green Coffee protocol is based on the SCA Green Arabica Coffee Classification System (GACCS) version Spring 2000 and the SCA Defect Handbook dated April 2, 2004. The Defect Handbook defines what are considered defects for the SCA GACCS. If the coffee imperfection is not found in the Defect Handbook, it is not considered a defect for purposes of Evaluation. The SCA GACCS determines the conversion or equivalent of single defects to full defects. The numbers of full defects are calculated on a basis of 350 grams of green coffee sample. Bean imperfections need to have the specific bean characteristics and criteria as they appear on the picture and physical description in the Defect Handbook to be considered a defect. A full defect can be a Category 1 (primary) or a Category 2 (secondary) defect. Specialty Grade samples must have zero Category 1 defects and no more than five Category 2 defects. A full defect is composed of one or more single defects depending on the impact each one has on the cup. Each defect is described in detail in the SCA Defect Handbook. A full defect cannot be a fraction or a decimal. The correct way to count a defect is to consider defect numbers as integers rounding down instead of up. In the case that more than one defect is observed in a coffee bean, it shall be counted only as the defect that has the greatest impact on the quality of the cup, (the defects listed first in the SCA Green Arabica Defect Handbook are considered to have the greatest impact on cup quality). The SCA GACCS only defines two grades of coffee, Specialty Grade and Premium Grade. Other grades need to be defined as "Not classified by SCA GACCS". In cases where several beans are considered to constitute a full defect (such as 5 broken beans = 1 full defect), the calculation showing the conversion of single defects to the correct amount of full defects must be shown. A bean is judged to be partial or full sour only if the orange/red color has fully penetrated the body of the bean, but not if the red color is only present on the silverskin (these are otherwise known as a "foxy" bean). A bean is deemed immature only if the silverskin is still firmly attached. To determine this, one may scratch it with a fingernail or rub the bean on a rough surface. This form may be downloaded from the SCA store and available for free to SCA members here. It is to be filled out completely. Each grader (primary grader and verification grader) must write their name, date and the Sample identification code number in the space provided. Show the calculation from individual defects to full defect equivalent. All final results are based on a 350 gram sample equivalent. Summarize the total number of Category 1 and Category 2 defects. This final result must be recorded on the upper right hand corner box of the grading form. Evaluation of the total number and type of defects will determine the grade (Specialty/ Below Specialty) of the sample. This result must appear in the box provided for GRADE. Each sample must be evaluated for color. Blue-Green, Bluish-Green and Green are the acceptable colors for Specialty Grade. A Greenish or inferior sample would not qualify. Each sample must also be evaluated for foreign odors. Graders need to stick their nose into the sample and inhale strongly to detect any foreign odor. Only samples that are completely free of foreign odors can qualify as Specialty Grade. The Statistics & Standards Committee of the SCA recommends these standards for cupping coffee. These guidelines will ensure the ability to most accurately assess the quality of the coffee. Cupping Glasses Cupping vessels shall be of tempered glass or ceramic material. They shall be between 7 and 9 fluid ounces (207 ml to 266 ml), with a top diameter of between 3 and 3.5 inches (76 - 89 mm). All cups used shall be of identical volume, dimensions and material of manufacture, and have lids. Each cup of sample should be ground by running a cleansing quantity of the sample through the grinder, and then grinding each cup's batch individually into the cupping glasses, ensuring that the whole and consistent quantity of sample gets deposited into each cup. A lid should be placed on each cup immediately after grinding. The hot water should be poured directly onto the measured grounds to the rim of the cup, making sure to wet all of the grounds. The grounds to steep undisturbed for a period of 3-5 minutes before evaluation. No one test can effectively address all of these, but they have common aspects. It is important for the evaluator to know the purpose of the test and how results will be used. The purpose of this cupping protocol is the determination of the cupper's perception of quality. The quality of specific flavor attributes is analyzed, and then drawing on the cupper's previous experience, samples are rated on a numeric scale. The scores between samples can then be compared. Coffees that receive higher scores should be noticeably better than coffees that receive lower scores. Theoretically, the above scale ranges from a minimum value of 0 to a maximum value of 10 points. The lower end of the scale is below specialty grade. When the sample has cooled to 160º F (71º C), in about 8-10 minutes from infusion, evaluation of the liquor should begin. The liquor is aspirated into the mouth in such a way as to cover as much area as possible, especially the tongue and upper palate.Because the retro nasal vapors are at their maximum intensity at these elevated temperatures, Flavor and Aftertaste are rated at this point. As the coffee continues to cool (160º F - 140º F), the Acidity, Body and Balance are rated next. Balance is the cupper's assessment of how well the Flavor, Aftertaste, Acidity, and Body fit together in a synergistic combination. Evaluation of the liquor should cease when the sample reaches 70º F (21º C) and the Overall score is determined by the cupper and given to the sample as "Cupper's Points" based on ALL of the combined attributes. After evaluating the samples, all the scores are added as describe in the "Scoring" section below and the Final Score is written in the upper right hand box. The attribute score is recorded in the appropriate box on the cupping form. On some of the positive attributes, there are two tick-mark scales. The vertical (up and down) scales are used to rank the intensity of the listed sensory component and are marked for the evaluator's record. The horizontal (left to right) scales are used to rate the panelist's perception of relative quality of the particular component based upon their perception of the sample and experiential understanding of quality. Fragrance/Aroma | The aromatic aspects include Fragrance (defined as the smell of the ground coffee when still dry) and Aroma (the smell of the coffee when infused with hot water). 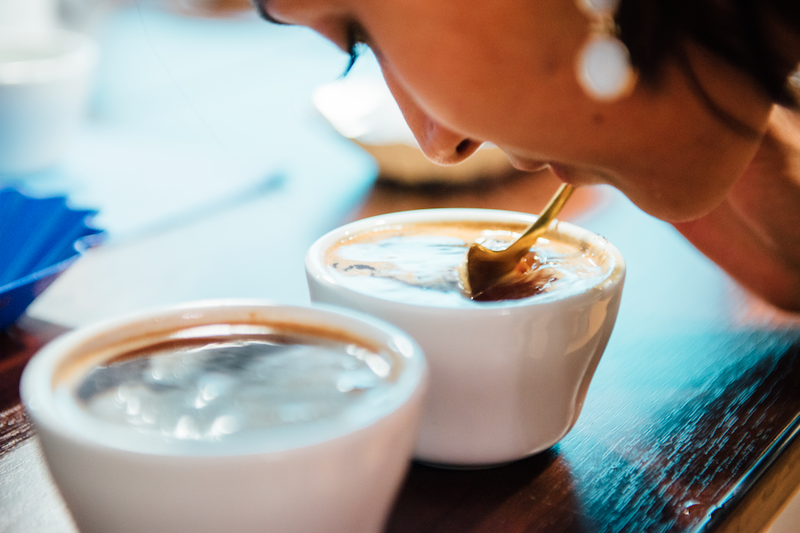 One can evaluate this at three distinct steps in the cupping process: (1) sniffing the grounds placed into the cup before pouring water onto the coffee; (2) sniffing the aromas released while breaking the crust; and (3) sniffing the aromas released as the coffee steeps. Specific aromas can be noted under "qualities" and the intensity of the dry, break, and wet aroma aspects noted on the 5-point vertical scales. The score finally given should reflect the preference of all three aspects of a sample's Fragrance/Aroma. Flavor | Flavor represents the coffee's principal character, the "mid-range" notes, in between the first impressions given by the coffee's first aroma and acidity to its final aftertaste. It is a combined impression of all the gustatory (taste bud) sensations and retro-nasal aromas that go from the mouth to nose. The score given for Flavor should account for the intensity, quality and complexity of its combined taste and aroma, experienced when the coffee is slurped into the mouth vigorously so as to involve the entire palate in the evaluation. Aftertaste | Aftertaste is defined as the length of positive flavor (taste and aroma) qualities emanating from the back of the palate and remaining after the coffee is expectorated or swallowed. If the aftertaste were short or unpleasant, a lower score would be given. Acidity | Acidity is often described as "brightness" when favorable or "sour" when unfavorable. At its best, acidity contributes to a coffee's liveliness, sweetness, and fresh- fruit character and is almost immediately experienced and evaluated when the coffee is first slurped into the mouth. Acidity that is overly intense or dominating may be unpleasant, however, and excessive acidity may not be appropriate to the flavor profile of the sample. The final score marked on the horizontal tick-mark scale should reflect the panelist's perceived quality for the Acidity relative to the expected flavor profile based on origin characteristics and/or other factors (degree of roast, intended use, etc.). Coffees expected to be high in Acidity, such as a Kenya coffee, or coffees expected to be low in Acidity, such as a Sumatra coffee, can receive equally high preference scores although their intensity rankings will be quite different. Body | The quality of Body is based upon the tactile feeling of the liquid in the mouth, especially as perceived between the tongue and roof of the mouth. Most samples with heavy Body may also receive a high score in terms of quality due to the presence of brew colloids and sucrose. Some samples with lighter Body may also have a pleasant feeling in the mouth, however. Coffees expected to be high in Body, such as a Sumatra coffee, or coffees expected to be low in Body, such as a Mexican coffee, can receive equally high preference scores although their intensity rankings will be quite different. Balance | How all the various aspects of Flavor, Aftertaste, Acidity and Body of the sample work together and complement or contrast to each other is Balance. If the sample is lacking in certain aroma or taste attributes or if some attributes are overpowering, the Balance score would be reduced. Sweetness | Sweetness refers to a pleasing fullness of flavor as well as any obvious sweetness and its perception is the result of the presence of certain carbohydrates. The opposite of sweetness in this context is sour, astringency or "green" flavors. This quality may not be directly perceived as in sucrose-laden products such as soft drinks, but will affect other flavor attributes. 2 points are awarded for each cup displaying this attribute for a maximum score of 10 points. Clean Cup | Clean Cup refers to a lack of interfering negative impressions from first ingestion to final aftertaste, a "transparency" of cup. In evaluating this attribute, notice the total flavor experience from the time of the initial ingestion to final swallowing or expectoration. Any non-coffee like tastes or aromas will disqualify an individual cup. 2 points are awarded for each cup displaying the attribute of Clean Cup. Uniformity | Uniformity refers to consistency of flavor of the different cups of the sample tasted. If the cups taste different, the rating of this aspect would not be as high. 2 points are awarded for each cup displaying this attribute, with a maximum of 10 points if all 5 cups are the same. Overall | The "overall" scoring aspect is meant to reflect the holistically integrated rating of the sample as perceived by the individual panelist. A sample with many highly pleasant aspects, but not quite "measuring up" would receive a lower rating. A coffee that met expectations as to its character and reflected particular origin flavor qualities would receive a high score. An exemplary example of preferred characteristics not fully reflected in the individual score of the individual attributes might receive an even higher score. This is the step where the panelists make their personal appraisal. Defects | Defects are negative or poor flavors that detract from the quality of the coffee. These are classified in 2 ways. A taint is an off-flavor that is noticeable, but not overwhelming, usually found in the aromatic aspects. A "taint" is given a "2" in intensity. A fault is an off-flavor, usually found in the taste aspects, that is either overwhelming or renders the sample unpalatable and is given an intensity rating of "4". The defect must first be classified (as a taint or a fault), then described ("sour," "rubbery," "ferment," "phenolic" for example) and the description written down. The number of cups in which the defect was found is then noted, and the intensity of the defect is recorded as either a 2 or 4. The defect score is multiplied and subtracted from the total score according to directions on the cupping form. The Final Score is calculated by first summing the individual scores given for each of the primary attributes in the box marked "Total Score." Defects are then subtracted from the "Total Score" to arrive at a "Final Score." The following Scoring Key has proven to be a meaningful way to describe the range of coffee quality for the Final Score. Coffee-to-Water Ratio: To achieve the Golden Cup Standard, the recommended coffee-to-water ratio is 55 g/L ± 10%. Coffee Preparation Temperature: To achieve the Golden Cup Standard, water temperature, at the point of contact with coffee, is recommended to fall between 200°F ± 5° (93.0°C ± 3°). Separation of coffee products is recognized as an SCAA Best Practice in manufacturing, including quality control and product development functions to protect the integrity of coffee products and prevent product contamination. Roasted coffee and raw (green) coffee products shall be separated, also organic and non-organic coffee products shall be further separated. The following areas should have provisions for separating green coffee and roasted coffee, organic coffee and non-organic coffee. This list may not be complete for all coffee companies and operational situations.